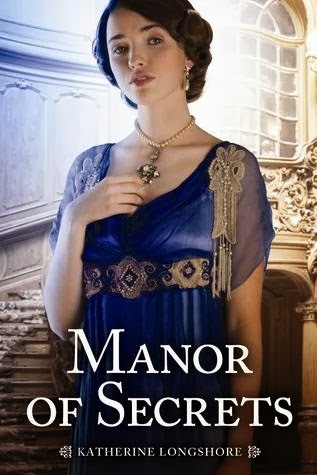 I keep seeking out historical books such as Manor of Secrets in the hope that I'll find a book as good as Downton Abbey, and sadly I have yet to find any books that meet my (extremely high) expectations. 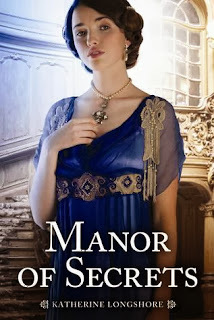 In fact, this book reminded me a LOT of Wentworth Hall, a similar historical book with a Downton Abbey-esque feel to it. Still, Manor of Secrets was a fun, quick read and I'm glad I got the chance to read it. Manor of Secrets reads a lot like a cliché yet addictive soap opera. Yes, it had many moments that made me roll my eyes. Yes, the large cast of characters was occasionally confusing. Yes, there were some overly dramatic plot twists at the end that are easy to guess if you were paying attention. But despite all this, I have to admit that I did enjoy this book. I liked the main characters, Charlotte and Janie. They could've had more character development and they acted a bit unrealistically at times; however, they're easy to root for. They both want change in their lives and want to be given a choice. This is why I love the time period of the early 1900s: it's right before all the changes that happened in the 1920s, and it's fascinating to read about sheltered girls who long to make a difference in the world and learn to break free. The author handled the characters well and I really like the way their stories are resolved. The plot is full of drama, drama, drama. I know that this aspect got on my nerves slightly, but at the same time I loved it. All the different, small storylines are intertwined very well and it will keep you reading for sure. I sped through this book in the space of a couple hours. Even if you don't care for all the drama, it's by no means boring and it'll still hold your attention. I'm not really sure if I'd recommend Manor of Secrets, as it really depends on the reader. If you're in the mood for a fluffy, guilty-pleasure type of read, this will probably be a good book for you. I liked the theme of the book, about Charlotte and Janie choosing to change their lives, and I liked the fast-paced plot. Just be warned that this book has its share of cheesy moments. It's not quite as good as Downton Abbey, but it's fun historical escapism and I'll probably read more of this author's books when I get the chance. *I received a free copy from Netgalley in exchange for an honest review. Thanks!